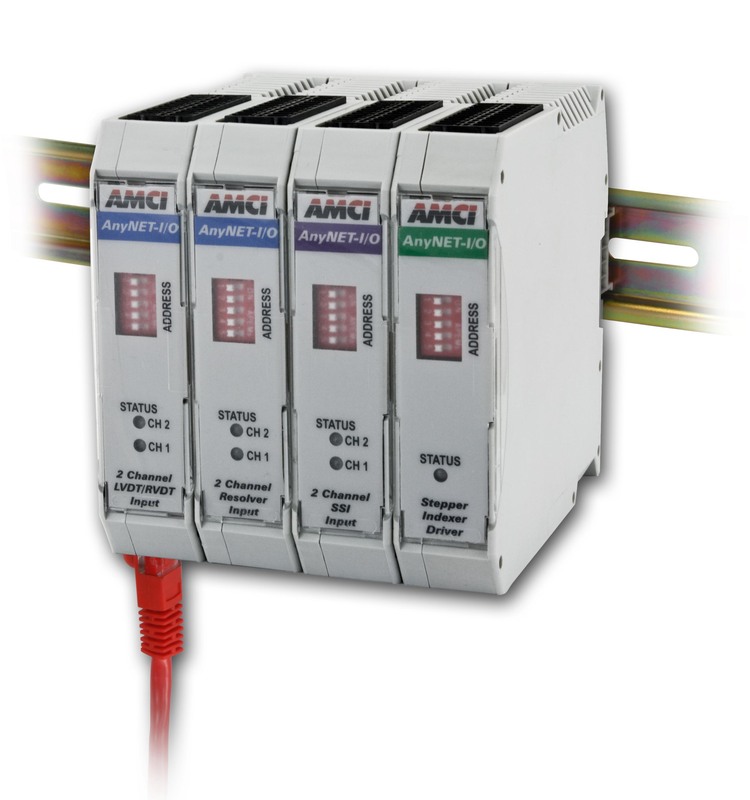 AMCI announces the expansion of their Specialty I/O products for PLC-based control systems. AMCI’s AnyNET I/O family is a distributed I/O system that combines hard to find specialty functions with a network interface, simplifying installation and cutting costs. Advanced Micro Controls Inc. (AMCI), announces the expansion of their Specialty I/O products for PLC-based control systems. AMCI’s AnyNET I/O family is a distributed I/O system that combines hard to find specialty functions with a network interface, simplifying installation and cutting costs. The product family allows users to “mix & match” functions, including stepper motion control and a variety of sensor interfaces, into a single solution. AnyNET I/O is compatible with any networked PLC/PAC and easily programs through the host PLC’s software. The AnyNET I/O’s innovative product design simplifies installation, optimizes network performance, and ensures system integrity. AMCI’s AnyNET products integrate Specialty I/O functionality and a network interface into one, compact package that communicates with the host controller (PLC or PAC) over the network. AnyNET products are offered with a variety of network interfaces to ensure compatibility with the user's PLC or PAC. The solution easily mounts on a standard DIN rail, simplifying installation and lowering costs. All programming is performed by the same software used to configure the host PLC/PAC, eliminating the need to learn new software and/or language foreign to the existing controls environment. AnyNET I/O easily expands from 1 to 6 I/O modules by stacking additional units onto the “gateway”, and only requires a single network connection for all communication. This solution allows users to combine different specialty functions on a single network connection, letting users customize powerful automation solutions for any PLC-based application. Integrated Stepper Motor Controller + Drive: Each module provides 1 axis of motion with encoder feedback, allowing users to expand up to 6 axes of motion control on one connection. SSI Interface: Each module provides 2 channels, allowing users to interface up to 12 SSI sensors using a single network connection. LVDT/RVDT Signal Conditioner: Each module provides 2 channels, allowing users to interface up to 12 LVDT or RVDT sensors using a single network connection. Direct interface to 3-wire, 4-wire, 5-wire, 6-wire, and half bridge LVDT sensors. Resolver Interface: Each module provides 2 channels, allowing users to interface up to 12 resolver sensors using a single network connection. The AnyNET resolver interface is compatible with most resolvers on the market.